On Sunday morning, a man opened fire inside a gay nightclub in Orlando called Pulse, where over 300 people were celebrating Pride Month. He killed 49 people and injured 53 more in the deadliest mass shooting perpetrated by a single individual in U.S. history. The massacre occurred during Pulse's Latin night, and an overwhelming number of victims were people of color; specifically, members of the Latinx community — over half of the victims were from Puerto Rico. When the killer was identified, many media outlets immediately began repeating his name and discussing his ties to Islam, and his alleged ties to ISIS and other terrorist organizations, though he was an American, and born in New York. Many politicians decided to politicize the situation, like Hillary Clinton, who invoked the term "radical Islamism" while discussing the attack on Today, and Donald Trump, who blamed the attack on U.S. immigration policies and then further pushed his idea of a Muslim immigration ban. Many incorrectly believe that the attacks were somehow motivated by Muslim ideology, even though Muslim leaders roundly condemned the attack. This line of thinking has led many Muslims to have to deal with serious threats made by bigots — an NPR report on the Islamic Center of Orlando reported that the mosque "alerted the police, but now they have also hired an armed guard to patrol the grounds during prayer services" after receiving violent threats in the wake of the attack. As a Pakistani-American and a Muslim myself, I certainly felt initial fear that this incident would send yet another wave of anti-Muslim sentiment throughout the American media. I also feared that the deaths of the LGBTQ people at Pulse would be used to justify hatred towards the Muslim world, which contains many LGBTQ people. Quickly, I felt that my fears were proven correct. We must acknowledge that ISIS may have had a role in the shooter's actions. But the glaring problem here is that by associating the shooter with Islam, we are both keeping the conversation from focusing on important parts of this tragedy, and perpetuating a false representation of Islam and millions of Muslims. This way of discussing the shooter can boost harmful anti-Muslim rhetoric, which persecutes the 1.6 billion Muslims in the world, many of whom denounce violence against LGBTQ communities, openly accept LGBTQ people whether they're Muslim or non-Muslim, and are queer and trans themselves. It is not enough for Muslim people to come out in support of the Orlando victims but hate their queer and trans brothers, sisters, and children. I'm not saying that Muslim communities are perfect and free from homophobic and transphobic blemishes; Muslim culture can be homophobic, and there are very few safe spaces in Muslim countries and communities that are not underground. Most Muslim LGBTQ people know this well—from queer people in Pakistan, where LGBTQ people can be punished by prison, to Iran, where homosexuality is punishable by lashes or death. In the wake of the Orlando shootings, Muslim communities can take this opportunity to work to better address their own homophobic and transphobic practices and beliefs, and strive towards progress in their day-to-day treatment of their fellow LGBTQ Muslims. However, I believe that it is completely inappropriate for some politicians and media outlets in the United States to completely absolve themselves of responsibility for perpetuating the rhetoric that Muslims are the most homophobic group of people, while not acknowledging the idea that homegrown homophobia could have fueled this crime, rather than homophobia based in religious beliefs. A number of major media outlets and politicians alike have focused on discussing the crime in terms of being possibly motivated by religious beliefs — which I believe distracts us from many larger issues. For starters, it distracts us from addressing the homophobia and transphobia that run rampant within our own nation. Within just the last six months, lawmakers in the United States have filed more than 200 anti-LGBTQ laws, most of which specifically target trans people and trans people of color. The majority of states in the United States still allow health insurance exclusions for trans people. Arkansas, Georgia, Indiana, South Carolina and Wyoming still don't have any hate crime laws. A large number of states still allow employment discrimination based on sexual orientation and gender identity. Last year, 23 trans women, many of them women of color, were murdered. In the wake of the Orlando attacks, gay men who wanted to give blood to those injured were unable because of archaic, homophobic laws preventing it. Even after the massacre in Orlando, GOP house leaders blocked a vote on a proposal that would ensure that federal contractors are unable to discriminate against employees based on sexual orientation or gender identity. New rumors have emerged that the shooter himself was gay and was active on gay dating sites and apps. Four regulars at Pulse also allege that they had seen him at Pulse multiple times, and his ex-wife told Time that she questioned his sexuality at times. Since the gunman is dead, it's very difficult to verify any of these allegations and reports. But they point at other possible motivations for his attack — and it's worth noting that his ties with ISIS were the first talking point the media jumped to, instead of speculating on other potential motivations. The extensive discussion of the shooter's potential ISIS ties (which many have taken as an opportunity to engage in Islamaphobic commentary) also distracts us from identifying and naming those who died, were injured, and survived the attacks at Pulse. Though many politicians and others have addressed the tragedy without acknowledging that a specific community was targeted by the attack (as also noted by the Washington Post), it is very important that we specifically note that the shooting occurred at a gay night club during a Latin night. The majority of victims were Latinx, and many others were black and brown. Data from a 2014 report from the National Coalition of Anti-Violence showed that 43 percent of survivors of anti-LGBTQ violence identified as Latinx, even though only LGBTQ Latinx only make up 17 percent of U.S. population. Much coverage of the shooting has failed to mention that LGBTQ people of color face constant systemic oppression on several different levels, and that Latinx and black LGBTQ people face disproportionate amounts of violence compared to their LGBTQ counterparts. By devoting so much airtime to the shooter's alleged ties with "radical Islamism," we're devoting less airtime to discussions of gun control, and how the shooter was able to purchase an AR-15 rifle. By focusing the discussion on the shooter's supposed religious motivations, we're also missing opportunities to focus on moments of positivity, like the story of Mahmoud ElAwadi, a Muslim man who donated blood to Pulse victims during Ramadan, a month where Muslims abstain from food or drink from sunrise to sunset. Or the fact that Islamic civil rights group CAIRnational urged Muslims to break their fast and donate blood to victims, or the overwhelming number of donors who showed up to give blood to those injured in the shootings or the 4 million dollars raised by over 90,000 people in 48 hours on a GoFundMe page started to support victims and their families. We've seen fewer headlines about all the pride events which paused to pay tribute to victims, and all the vigils that brought together thousands of people all over the country and world. By choosing not to focus more on this, much media coverage of the attacks missed an opportunity to shine a light on the instance of positivity and solidarity — specifically, instance of positivity and solidarity from Muslims, who were villainized in so much coverage of the attacks. This lack of coverage also erased the role that queer and trans Muslims play in both the world at large and in these acts of solidarity. So much coverage has also failed to discuss that this event happened during the holy month of Ramadan — and almost no media coverage I have seen has discussed the point that if the shooter were truly following the teachings of the Quran, the teachings of which Trump supporters and countless other Americans fear, he would not have killed. Not during Ramadan, not ever. I didn't see a discussion of the fact that the word "Islam" means peace. We celebrate Ramadan to express solidarity with the oppressed, the less privileged, and the persecuted, and to take some time to understand how we as Muslims can be a force in positively shaping the world and making every community safer for every individual, regardless of religion. My Muslim family raised me to always elevate the voices and stories of those who are silenced. 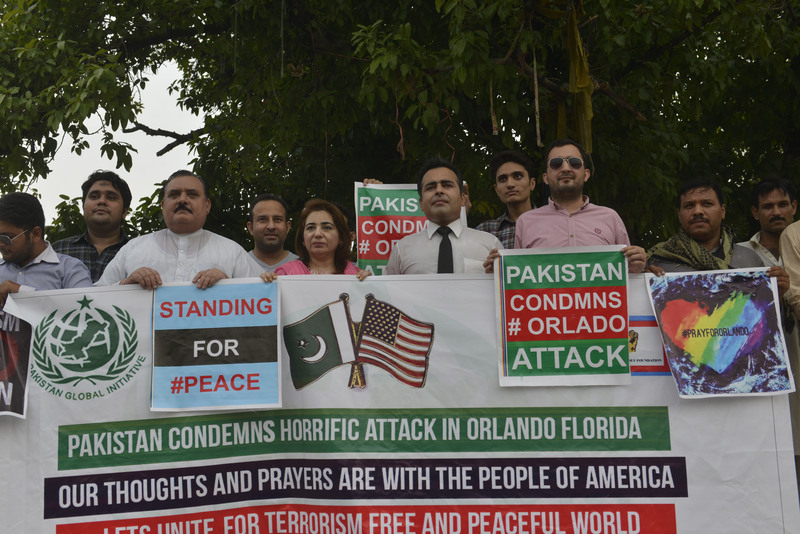 The version of Islam practiced by the Orlando shooter is not representative of how millions of Muslims worldwide interpret the Quran and hadiths . His actions were not consistent with the teachings of millions of Muslims all over the world, almost all of whom reject ISIS. But very few media stories will tell you that. So in the wake of this tragedy, it's important to pay attention to what we're actually discussing when we discuss the Orlando shooting. Most importantly, let's stand in solidarity with the Latinx community affected most by this tragedy, LGBTQ Muslims whose existence is being undermined, brown LGBTQ people, and LGBTQ people all over the world, and help in any possible way we can.